With the forecasted below zero temperatures this week, all residential trash, heavy trash, and recycling collection will be canceled on Wednesday, January 30 and Thursday, January 31. Normal service will resume on Friday, February 1. Routes missed will receive a double pickup on Wednesday, February 6 and Thursday, February 7. Residents with canceled routes may set bags outside of their carts for pickup next week. The dangerously frigid temperatures bring safety risks to DPW drivers as frostbite can occur quickly. The frigid air also impacts the performance of residential trash trucks, inhibiting their ability to run properly. Residents are reminded that colder temperatures may require extra time of DPW staff on regular pickup routes, as crews must allow time to warm up equipment for regular use. For more information or to report any trash-related issues, please use RequestIndy online or the mobile application on your smartphone, visit www.indy.gov/dpw or call the Mayor’s Action Center at 317-327-4622. The post Indianapolis Trash & Recycling Collection Canceled January 30th & 31st 2019 appeared first on Naptown Buzz. The Indianapolis Department of Public Works (DPW) has 80 salt trucks out pre-treating roadways ahead of the snow and frigid temperatures. Crews will remain on city roadways through the morning commute on Tuesday. With the forecasted snowfall, freezing temperatures and wind gusts, crews will be addressing bridge decks, overpasses and major thoroughfares. DPW crews will also be treating ADA ramps downtown to prevent hazardous conditions. Forestry crews will be on standby to address any fallen debris in the public-right-of-way. Ahead of the frigid temperatures expected this week, 20 DPW street crews will be out patching roadways across the city today. DPW would like to remind residents to drive with care as crews are out repairing city streets. The Indy Snow Force Viewer will activate at 3 p.m. on Monday when drivers are on the roadways to show real-time movements of DPW trucks. The Indy Snow Force Viewer displays which streets have been treated with salt or plowed of snow. Give plow trucks plenty of room and look out for flashing amber lights to identify trucks out on the road. For a list of winter driving tips and ways residents can stay safe while driving in the snow, visit indy.gov/snow Updates are also available on Twitter @IndySnowForce. The post DPW Is Pre-treating Roads & Patching Potholes appeared first on Naptown Buzz. The Indianapolis Department of Public Works (DPW) will have 33 drivers on standby throughout the weekend as predictions call for rain turning to light snow beginning late Friday night. If called to report, drivers will address bridge decks, overpasses and major thoroughfares as necessary to prevent hazardous road conditions. DPW will monitor road and weather conditions throughout the weekend to address any changes that occur in the forecast. The city is encouraging residents to adhere to travel advisories and exercise caution on roadways throughout the winter months. For a list of winter driving tips and ways residents can stay safe while driving in the snow, visit indy.gov/snow Updates are also available @IndySnowForce. The post DPW On Standby As Light Snow Arrives For Weekend appeared first on Naptown Buzz. The Indianapolis Department of Public Works (DPW) will finalize the conversion of Central Avenue south of E Fall Creek Parkway N Drive to two-way traffic after the morning commute on Thursday, November 15, weather permitting. Motorists should watch for crews programming traffic lights and finishing pavement markings on the street. No lane closures or restrictions are expected. DPW and IndyGo have coordinated on the $2.5 million two-way conversion project in order to improve pedestrian safety, traffic circulation and access to transit. Previously, the thoroughfare allowed for southbound traffic between E Fall Creek Parkway N Drive and the intersection of Central Avenue, Fort Wayne Avenue, East Street and 10th Street. See the images below for details. Construction began on this project in early August. Work included resurfacing Central Avenue between E Fall Creek Parkway S Drive and 10th Street and Fort Wayne Avenue between Alabama and 10th streets, as well as major changes to traffic signals and road striping at affected intersections. Curb ramps, transit boarding pads, crosswalk infrastructure and some new parking areas have also been added along Central Avenue. 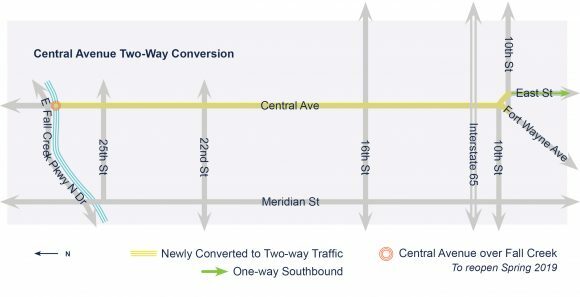 The post Central Ave South Of Fall Creek Switches To Two-Way Traffic November 15, 2018 appeared first on Naptown Buzz. On Monday, November 12, the Indianapolis Department of Public Works (DPW) will begin collecting bagged leaves through Friday, December 7. Residents can leave out up to 40 bags of leaves per week during the four-week collection period. Leaf collection dates coincide with the time of year that the most leaves are determined to fall from trees. DPW works with the Purdue Extension to determine the four-week collection period. DPW’s leaf collection service is offered at no additional cost to residents. Place leaves in plastic bags. Paper bags can deteriorate and break apart in wet weather. Keep bags at least three feet away from your trash cart for easy pick up. Leaf bags should be outside by 7 a.m. on your normal trash day. While raking leaves, DPW asks that residents clear leaves from storm drain inlets to prevent drainage and flooding problems. Last year, DPW collected about 5,000 tons of leaves from Marion County residents. As in years past, the collected leaves are taken to the South Side Landfill where they are composted. Residents can pick up the resulting mulch in the spring. The first day of leaf collection falls on Veterans Day. Trash pick up, including leaf pickup service, will run as normal. Open burning is illegal in Marion County. Try composting as an alternative to traditional raking and bagging. The post Indianapolis Leaf Collection Begins on November 12, 2018 appeared first on Naptown Buzz. Light rain and snow possible through this evening. Minor accumulations possible parts of northern Indiana. On this date in 1921: 3.8″ of snow falls at Indianapolis, establishing the record snowfall for November 9. The post Naptown Weather Forecast (November 9, 2018 AM) #INwx appeared first on Naptown Buzz. Check out the recap from November 1-8, 2018, of the Greater Indianapolis area podcast scene! The post Indy Weekly Podcast Roundup (November 1-8, 2018) #IndyPodcasts appeared first on Naptown Buzz. Check out the recap of November 1-8, 2018, from the Indianapolis blog scene. Money-Making Side Hustles | Which One Is Best For You? Squealers is here for all your Holiday Party needs! The Seldom Used, Little Known, Secret that will Improve Your Trade Show Results! How Many of Your Employees Are in Sales? The post Indy Blog Roundup (November 1-8, 2018) #IndyBlogs appeared first on Naptown Buzz.